Dermatologist, pharmacist, and medical school professor, Dr. Howard Murad is a man on a mission, to provide the world with the skin care products he wished he had had for his first 50,000 patients. A practicing dermatologist for decades, Dr. Murad and his family set up a company to provide acne and wrinkle treatment products over the Internet, through other doctors, and at Boots cosmetic stores all over the world 1. And Dr. Murad has done something that many doctors would not. Murad products, which contain the ingredient hydroquinone, can irritate the skin. Murad advises his patients not to run to their dermatologists to get treatment for acne scars. That is, patients should not plan for expensive procedures to remove blemishes at least before they know what the blemishes are. Murad is a leader in the production of skin care kits that contain the controversial skin lightening agent hydroquinone. Murad products are great for removing acne-related pigmentation if you have fair skin. Murad acne treatment kits contain a number of ingredients that can irritate any type of skin. Sometimes acne destroys the skin and leaves a scar. The scar can be raised above surrounding skin, or the tissues beneath the scar can atrophy so that the scar lies beneath the contour of surrounding skin 2. But some scars are not really scars at all. Acne inflammation can leave hyperpigmentation, and overproduction of skin pigment that appears pink or red instead of the more usual brown, especially on lighter skin. When acne bacteria infect pores, the immune system releases free radicals of oxygen to dissolve them 3. The melanocytes, which are the skin cells that make the brown and gold pigments of healthy skin, protect surrounding skin with a versatile antioxidant, melanin. This melanin is the same pigment that gives skin its darker tones. Melanin concentrates around regions of inflammation, and sometimes permanently discolors the skin. While darker skins tend to produce more obvious spots, lighter skins sometimes produce regions of discoloration that at first glance look like scars, but aren’t. How can you tell the difference? The acne scar test is extremely simple. Run your finger over the “scar.” If it feels like surrounding skin, it probably is not a scar. And you may be better off to try a lightening agent before you spend hundreds or thousands of dollars just to get your skin assessed at the dermatologist’s office. Dr. Murad is famous for his pioneering use of hydroquinone for treatment of hyperpigmentation caused by acne. Frankly, hydroquinone is not for everyone. It is the strongest skin lightener you can get without a prescription, and if your skin has dark brown or gold skin tones you should never use it. If you have fair skin, and especially if you have blond or red hair and blue eyes, then hydroquinone will lighten skin better than any other over the counter acne treatment. The way hydroquinone works is by alkalizing the skin. This process releases oxygen and stimulates circulation. Oxygen, of course, is not always a good thing for the skin. When oxygen is exposed to sunlight, it releases destructive free radicals of oxygen that can go beyond just breaking down pigment and start breaking down skin. It is essential for users of Murad’s hydroquinone acne treatment to use sunscreen when they use the skin lightening product. The alcohol in Murad’s Post-Acne Spot Lightening Gel can dry out the skin, so moisturizer is also a must. It may not be politically correct to put it quite so directly, but hydroquinone is an acne treatment for white people. If you don’t have a northern European heritage, chances are that it is not an appropriate treatment for your skin. Many people mar beautiful skin with rich brown, gold, or nearly black skin tones by using this product when they should not. Correcting the damage to skin treated with hydroquinone incorrectly is a very difficult task. The use of hydroquinone in skin treatment has always been controversial because of the potential to damage the skin when the products are not used exactly as directed. And from time to time the FDA has proposed to ban them for over the counter use for that reason. What About Other Murad Acne Products? 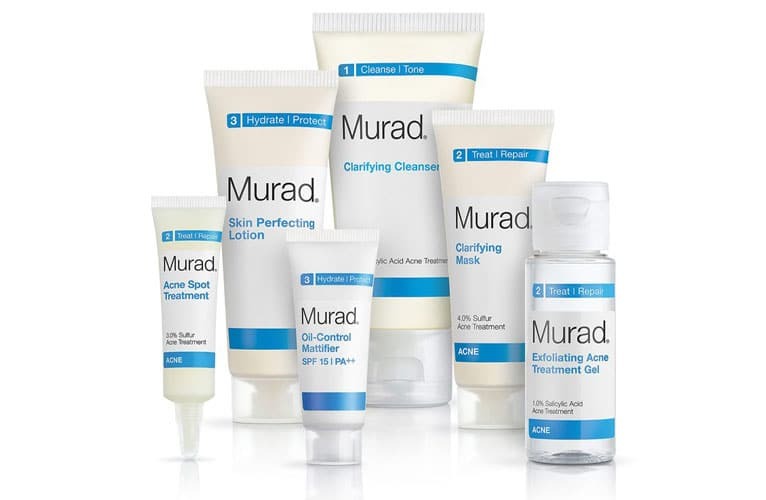 The Murad Company also markets two acne treatment kit. The Acne Complex Introductory Kit includes a cleanser, a gel, and a “skin perfecting” lotion. The more expensive Acne Complex Kit also includes a spot treatment for pimples problem. These kits are competitively priced, about US $30 plus shipping and handling for the introductory kit, and $60 for the kit that includes spot treatment. But there are serious problems with some of the products. The Murad acne spot treatment, which is also available separately for US $17.50 per half-ounce (14 grams) in Boots stores, kills acne bacteria with its 3% content of sulfur. The sulfur also irritates the skin. This spot treatment also contains a small amount of glycolic acid to exfoliate the skin around blemishes, removing dead skin to relieve tightness that keeps sebum and bacteria trapped inside. The glycolic acid is at the right pH to do its job (in most other products by most other manufacturers, it is not), but there are other treatments that cost less and do not cause irritation. Murad’s Clarifying Cleanser contains bitter orange, sweet orange, and lemon oils, along with menthol. These oils are fragrant. They make the skin feel tingly. They kill bacteria. They can also trigger allergic reactions in about 3% of the people who use them. Murad’s Exfoliating Acne Treatment Gel contains salicylic acid, a beta-hydroxy acid that is ideal for breaking up sebum on oily (although not dry) skin. Unfortunately, it does not have the salicylic acid at the right pH, and it also contains arnica, which can irritate all skin types. This gel will loosen dead skin and irritate healthy skin. Murad’s Skin Perfecting Lotion is a moisturizer with retinol, a form of vitamin A that stimulates the growth of the skin. Unfortunately, the moisturizer also contains arnica in a form that can evaporate and cause irritation on other parts of the body. Murad’s products are terrific if you are treating “acne scars that are not really acne scars” on fair skin. They aren’t all that great if you are treating everyday acne problems. So what’s a good alternative. If Murad is not for you, try Exposed Acne Treatment. The cost is about the same, and you won’t be exposing your skin to potentially damaging ingredients. It comes with a money-back guarantee, so the only thing you have to lose is your blemishes. Do Treatments Like Lerosett Really Cure Acne?